Two Case 921 wheel loaders working in British Columbia are defying conventional wisdom, shift by busy shift. The machines have recorded more than 41,000 hours and 38,000 hours respectively with original engines and transmissions. 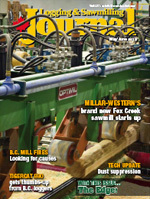 The loaders pay their way feeding logs into West Fraser’s sawmill in Quesnel. And they do it for 24 hours and 16 hours a day, five days a week. “How long can we run them? We don’t know. 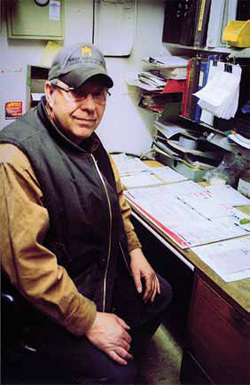 But they’re real solid loaders,” declares Jim Robinson, mobile equipment shop supervisor with West Fraser in Quesnel. For any skeptics out there, “we’ve got the books to prove it” says Robinson of the machines’ detailed and complete records from day one. The machines were purchased new from the Case dealer, Parker Pacific Equipment Sales in Quesnel. And the folk there are similarly impressed by the loaders’ performance and consistent avoidance of major repair costs and resultant downtime. “I haven’t heard of these kind of hours for this type of machine before. And it’s not just one, it’s two of them. It’s pretty incredible,” says Ken Taylor, Parkers Pacific’s branch manager. The Case 921 machines’ steady and reliable performance has endeared them to their operators. “The six regular operators running the three shifts absolutely love ‘em,” says Jim Robinson, (left) mobile equipment shop supervisor with West Fraser in Quesnel. West Fraser’s Robinson recalls the beginning of the story. The model year of the Case loaders were 2003 and 2004. It’s the 2004 machine that’s topped the 41,000 hour mark. “It had about 300 hours on it—it had been used as a demo machine— and we got a good deal on it,” he smiles. And that’s pretty much been the story ever since. They’ve not had to touch the Cummins engines or transmissions (for anything serious), continues Robinson. There was a scare with one of the 921s when it was running about 30,000 hours with its transmission shifting. But that was ultimately diagnosed as an electrical issue and corrected accordingly. Otherwise, says Robinson, it’s just been a case of ‘small’ things. Items like valve sets and work on injector pumps and brakes. It’s just been regular service. They’ve followed the (manufacturers) specifications. Service every 500 hours on the motors, they do the differentials and they use Case oil and always with the recommended additive. No magic formula there, it appears. Up until a couple of years ago, the Case 921s were starting, stopping, lifting and reversing with tree length stems in their Weldco-Beale grapples. Now West Fraser Quesnel’s logs are accurately processed into 20 foot and 16 foot lengths in the bush. The Quesnel log yard is a busy place. “We’re averaging about 120 loads a day,” says Robinson. The 921s are charged with feeding the mills’ log decks leading to three breakdown lines prefaced by a trio of Valon Kone Kodiak debarkers. The debarkers were fitted with dual rotors to help maintain the high speed debarking of mountain pine beetle-killed and damaged wood. The Quesnel region is one of the most severely hit by the beetle epidemic in B.C. 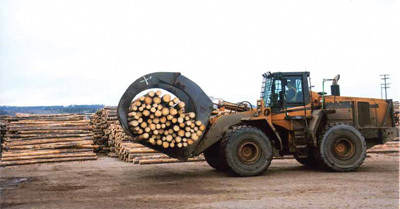 A large Cat 988 helps out with mill feeding when it can and isn’t working at unloading incoming logging trucks. Two high lift rubber tired loaders—a Sennebogen on site for about three years and a Liebherr (about a year)—are kept busy unloading trucks, decking and reclaiming. Physical space is at a premium in the Quesnel log yard. “We have to go up and go off site,” explains Robinson of that unfortunate fact of operating life. West Fraser maintains a satellite log yard near Nazko, west of Quesnel, close to some of its major logging operations. 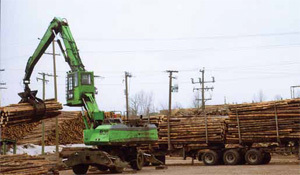 A Sennebogen is one of two high lift rubber tired loaders that are kept busy unloading trucks, decking and reclaiming in the log yard of West Fraser’s Quesnel sawmill. Physical space is at a premium, so they go up with decking the logs. The Case 921 machines’ steady and reliable performance has endeared them to their normal operators. “The six regular operators running the three shifts absolutely love ‘em,” says Robinson. And when it does (finally) come time to replace the machines, they’ve put in their two cents worth: They say, ‘buy us a Case’“. While they’re understandably sold on the Case 921 loaders at West Fraser in Quesnel, other regional operators have yet to jump on the band wagon in any big way. “As far as I know, we’re the only (regional) sawmill that’s running the Case loaders,” says Robinson. But perhaps the message has got through to the Pinnacle Renewable Energy Group. It has recently bought a fleet of five Case 921 wheel loaders. One is working at the company’s Meadowbank plant, about 41 kilometres north of Quesnel, with the rest assigned to the other Pinnacle wood pellet manufacturing plants in the Cariboo and Central Interior regions of B.C.